Besides being humongous hits, practically enshrining their artists in the hall of fame, each song just might be one of the most effective ambassadors of the language it represents. There’s just something about music, isn’t there? Music’s not only universal, but it’s also ubiquitous and no one can escape it. Interestingly, just about the same things can be said for language. It follows naturally, then, that music can be used as a key to become fluent in a foreign language. How? We’ll look at the connection between the two entities, plus share three effective ways to use music as a killer language learning strategy. So let’s start with this special relationship between the two that makes learning language through music possible. It was previously thought that language and music involved two distinct brain mechanisms. Speech functions were localized in the left brain hemisphere and language in the right. But advances in brain imaging technology have challenged that idea. Language and music are kindred spirits. Both have rhythm, tone, melody, pitch, volume and pauses. Just as one can differentiate music through these elements, a language can be defined by the same. They can both be learned through repeated exposure. They are so closely related that many scholars have begun considering the possibility that language is actually a subset of music. If you were asked, “Hey, which letter comes before ‘R’?,” chances are you’d find yourself singing the alphabet song just to make sure you didn’t give the wrong answer and embarrass yourself to pieces. And you probably have memorized the multiplication tables with the help of a catchy jingle or beat, or perhaps used a tune to learn the phone number of your favorite fast food delivery joint. It’s long been known that music makes things memorable. Ask any kindergartener. Certain songs trigger a flood of memories, good or bad. It can make vivid the events that happened a long, long time ago. You hear “That’s What Friends Are For,” and suddenly it’s 1986. Because of music, we can memorize ungodly amounts of information without real effort. We just sing the data away. There’s just something about melody that burn information into our heads—so much so that it gets annoying sometimes. You may still be singing your grocery list to the tune of “Call Me Maybe” weeks after you’ve done the shopping. Can you imagine how easy it would be to memorize a foreign sentence using a beloved nursery rhyme? Let’s say you need to memorize a sentence. How about the useful Spanish phrase “Un momento, por favor” (One moment, please). How do we exploit the memory-enhancing effect of music in this case? Easy. We code the target sentence to a catchy song or beat. A beloved nursery rhyme will often do the trick. Repeat as often as possible. This last step is another important one. You’ll find that it can sound a bit awkward at first. Don’t be discouraged and stick with it. Keep on singing until it stops being awkward. And when it stops being awkward, sing it around 30 more times. You will soon notice that the melody will lead you to the words. With enough repetitions, you’ll have burned the lyrics into your head for a lifetime. We can also use music to mine foreign songs for their vocabulary. There are two advantages to this. First, as mentioned previously, the melody will serve as a memory hook. And second, using the songs of your target language presents you with vocabulary used in a specific context. The Portuguese song “Lambada,” for example, is a song about past love. It talks about loss, pain and memory. True enough, you’ll find the words perder (lose), chorar (cry), dor (pain) and lembrar (remember) in the lyrics. One of the most common mistakes people make in learning a new language is memorizing vocabulary in a vacuum. That is, as a list, without examples, without context and without application. They spend countless sessions staring at a piece of paper containing two word columns: the English translation and the foreign words. Here’s why: The brain is an “association machine.” It remembers new information by connecting it with items that are already in there. So the memories or facts you most easily remember are those connected to the greatest number of other bits of information. Still follow? Just remember that for you to retain the vocabulary and store it in your long-term memory, you have to creatively connect them with something else. For example, if you were trying to remember the Portuguese word “dor” (pain), imagine your hand getting banged by the door. What do you feel? Pain, right? That’s it. I bet you’ll remember that! Songs create these kinds of opportunities for making connections, which is why they’re so memorable. People who can’t remember their children’s birthdays can easily memorize the lyrics to hundreds of songs. Aside from their memorable melodies, many songs have memorable stories in them as well. You simply have to follow the story and learn the vocabulary along the way. 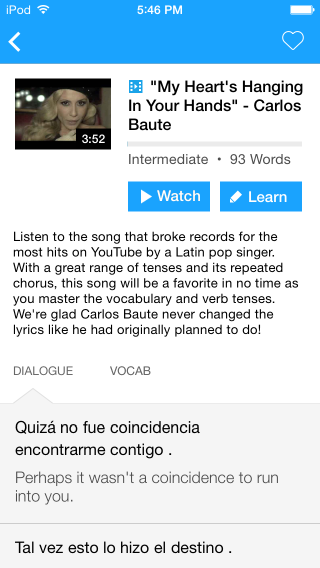 A perfect tool for learning languages in context with songs is FluentU. FluentU takes real-world videos like music videos, movie trailers, news and inspiring talks, and turns them into language learning lessons. Every video is transcribed and translated by hand, and every word comes with an in-context definition, image and multiple example sentences. You can even click on a word to see how it’s used in other videos across the site. Using FluentU to learn songs via music videos will lift your language learning abilities through the roof! Gloria Estefan got it right. Music has this almost transcendental effect on the human body. It moves us and it can make us move. We nod along and tap our fingers and feet to the beat, and sometimes we even let out a dance or two. We close our eyes and we are transported to a different place. The pleasure centers in the brain light up while the music could be fostering positivity, lifting the spirit, lowering anxiety and releasing tension. Music invigorates, relaxes and calms. And when one is calm, ideas flow easily and greater learning is achieved. You could also try putting on some instrumental music in the background; let the music take you to that place where creativity meets flow. Studies have shown that music can enhance the creativity of test subjects, even improving their reading and writing skills. With upbeat music, people are able to do things more efficiently. They stay on a task longer, they see it through—which is exactly the type of focus we need when learning a new language. Because here’s a basic truth about taming a language: It’s not easy. It’s not always fun and games, and can definitely be frustrating at times. Especially when you’re experiencing a plateau and you feel like your best efforts are leading nowhere. 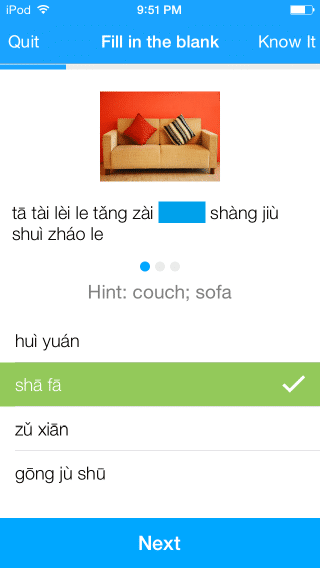 When your vocabulary’s out of whack and you realize that after three months of studying the language, you still don’t know the Chinese words for “How are you?,” don’t give up. Instead, try to get your bearings right. Listen to music. Use music in any (or all) of these three ways—to help you memorize, to learn vocabulary in context and to create a motivating study mood—and you will see results. Learning a new language is one of the best items on a person’s bucket list. So when you feel short on motivation, when you feel like nobody really cares that you know the Japanese translation for “continuous improvement” (Keizoku-teki kaizen), I want you to hit that “Play” button. Soon enough, the rhythm’s gonna get cha. Gloria had it right all along. If you like learning through music, you’ll love using FluentU. FluentU makes it possible to learn languages from music videos, commercials, news and inspiring talks.